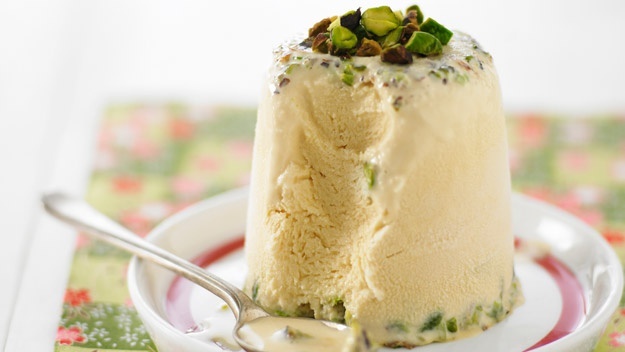 Under the title "Kulfi" hidden Indian ice cream. Varieties, of course, this Goodies a lot, but I suggest you cook it with white bread. Surprise your loved ones! First of all with the almonds, remove the skin. Actually to make it easier. In a small saucepan pour enough boiling water and put the almonds. Hold it there for several minutes. After this procedure the skin will be removed instantly. Bread will do that: cut from him the crusts and chop into pieces small size. Lay the resulting slices into a blender and connect them with corn starch and 1/2 Cup of whole milk. The resulting mixture mix well. You should get a homogeneous mass. The remaining whole milk pour into a saucepan and put it on the stove. When the liquid mass boils, cook it for another quarter of an hour the milk should be less by one-third. Then enter to the same bread mix. Simmer for 5 minutes. After a time to the milk mixture add the dry consisting of peeled almonds, cardamom and sugar. Mix as follows. Cook the mass until it thickens, about 10 minutes. Obtained milk mass is put into a suitable glass container. In this form, place it in the freezer not less than 7 hours. Ice cream must be fully frozen. "Kulfi" is ready! Optionally decorate the delicacy with pistachios.